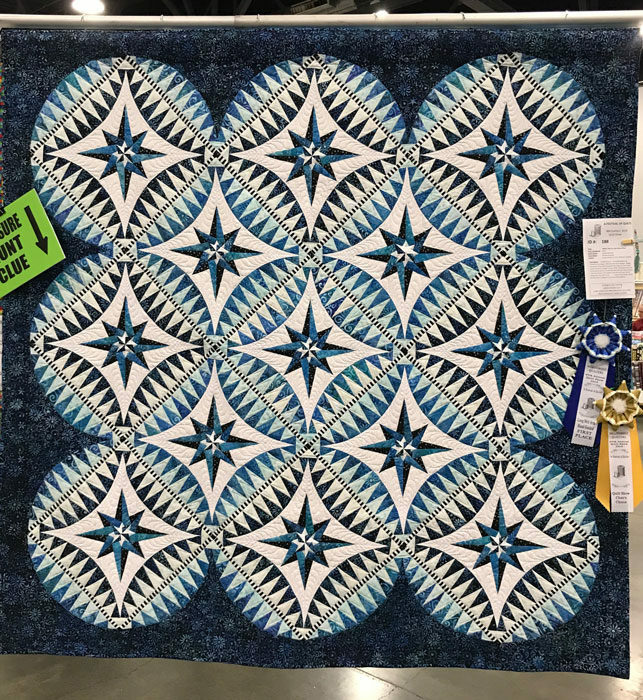 Yesterday was the Northwest Quilters Guild annual show at the Expo. I started the day with my talk about my design and construction process and the World Challenges I have participated in. A few minutes after I began my stepmother, Theola, and stepsister, Kelly, showed up. I was so surprised as neither of them are quilters. It’s always great to have family members take an interest in what you do, especially when it’s not their area of interest. 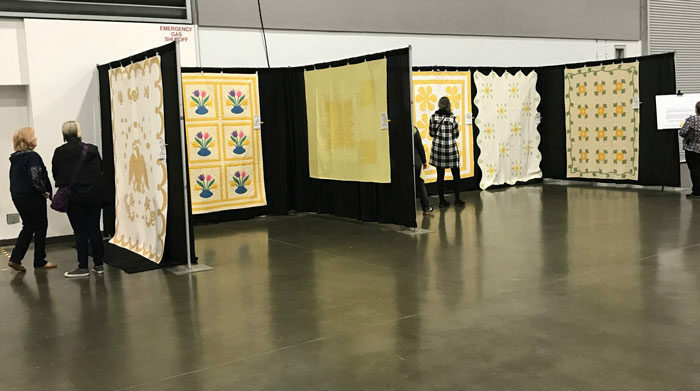 Here they are on the left viewing my vintage yellow quilts. 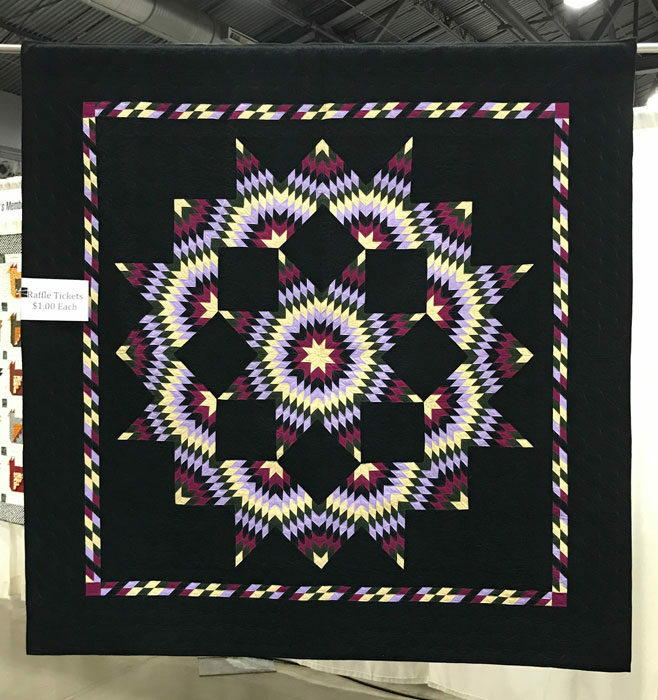 Theola said later the Eagle, Urn, Stars quilt was her favorite in the show. The only credit I can take for it is purchasing it. 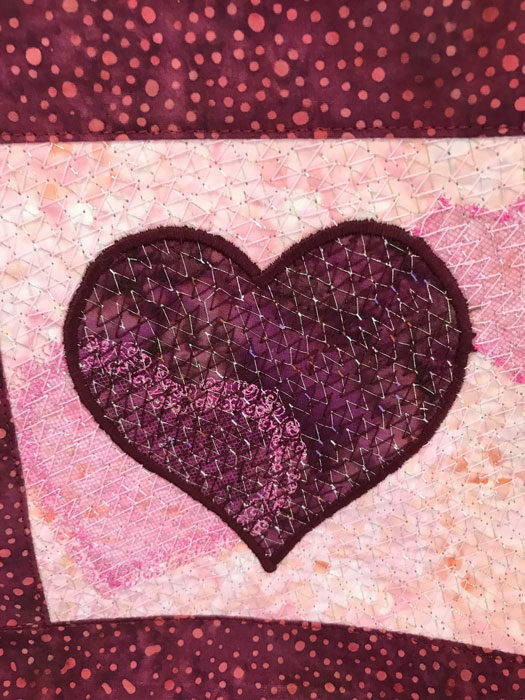 They had questions arising from my talk, such as what’s an appliqué quilt and how is piecing done. 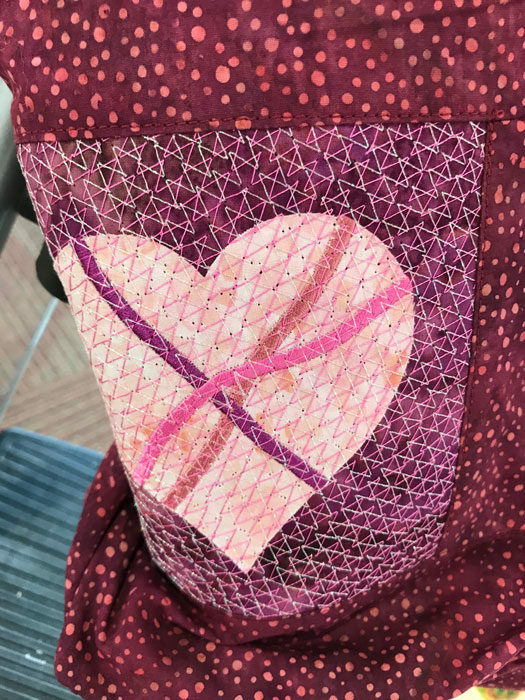 My stepmother is very creative and crafty, and Kelly is interested in fabric in general. 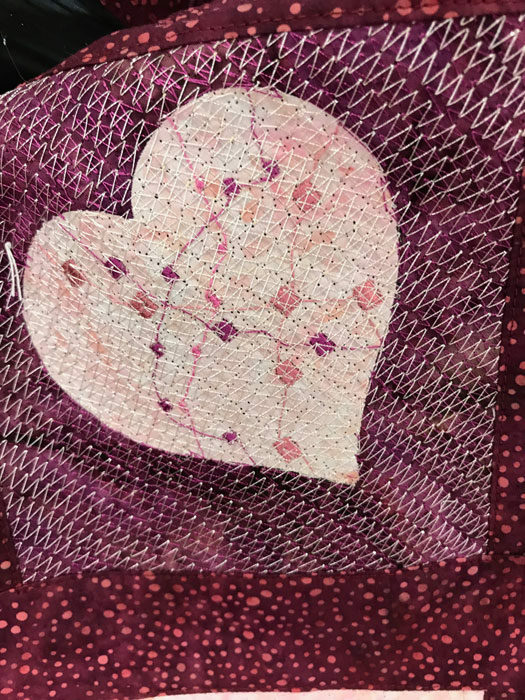 She may be a quilter yet. 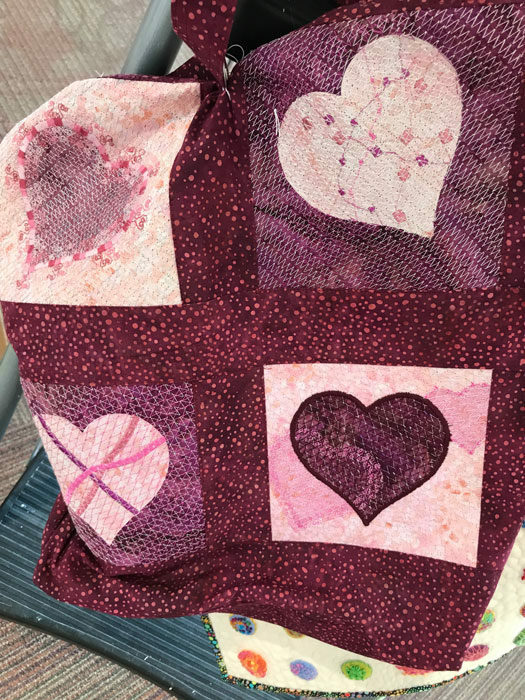 While we were talking I noticed something attached to my Double Irish Chain quilt. 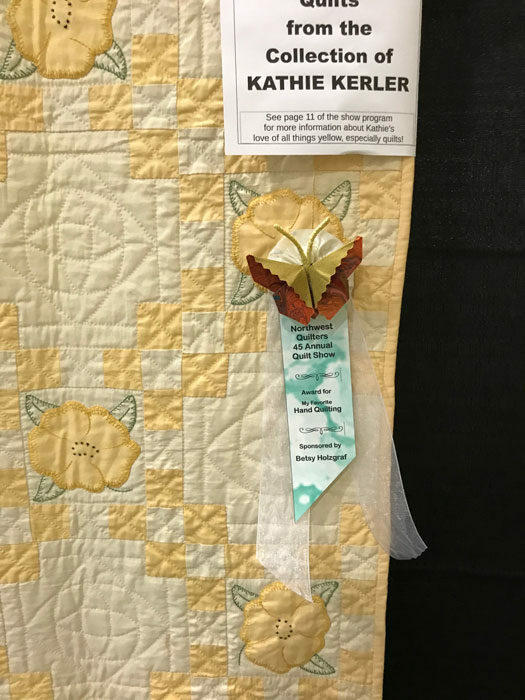 When I looked closer, I was surprised to find a ribbon for hand quilting. 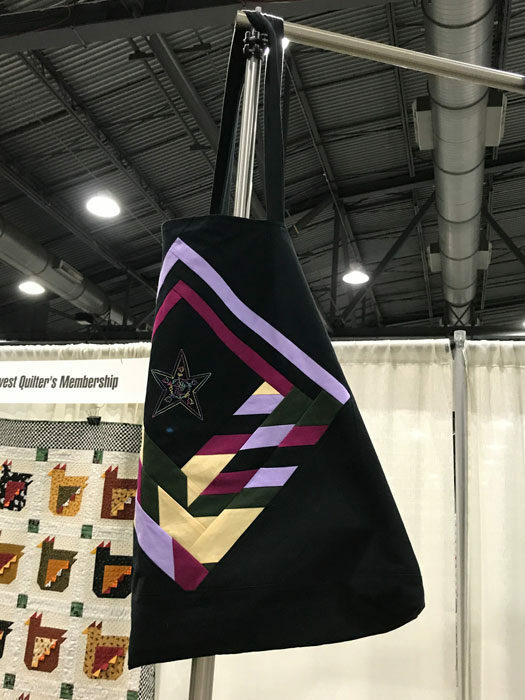 Our guild offers members the opportunity to award a ribbon for any technique or reason for a donation of $25.00 to the guild’s treasury. 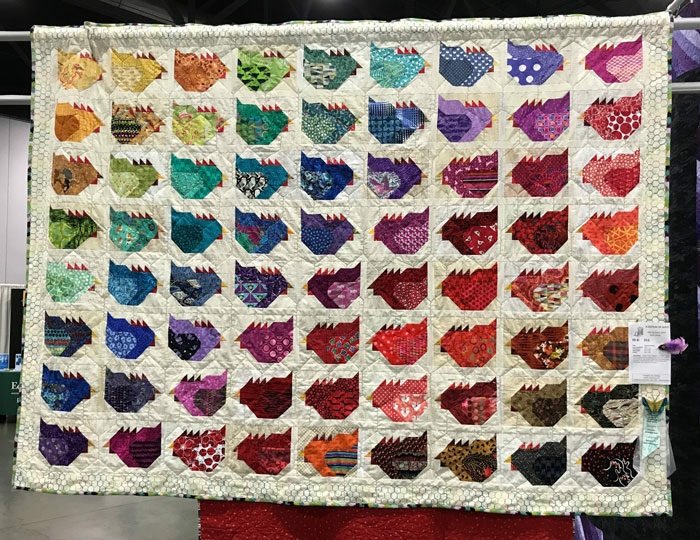 One of our members thought this wonderful quilt deserved her award. I wish the maker were alive to receive the honor. 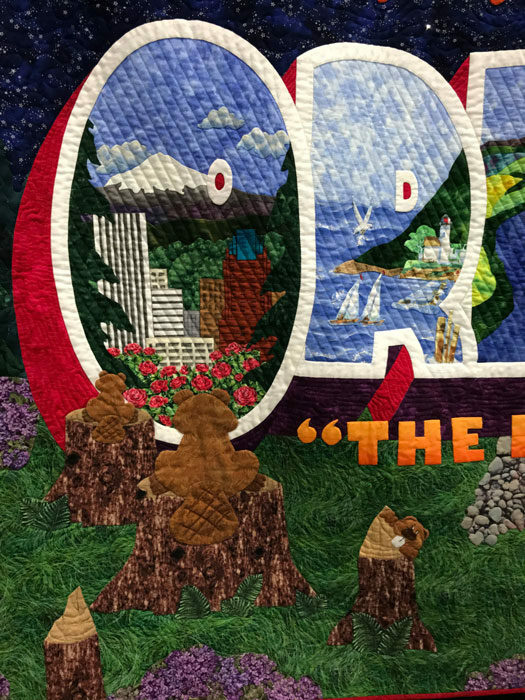 All of the quilts in the collection are hand-quilted, with this one deemed the best. 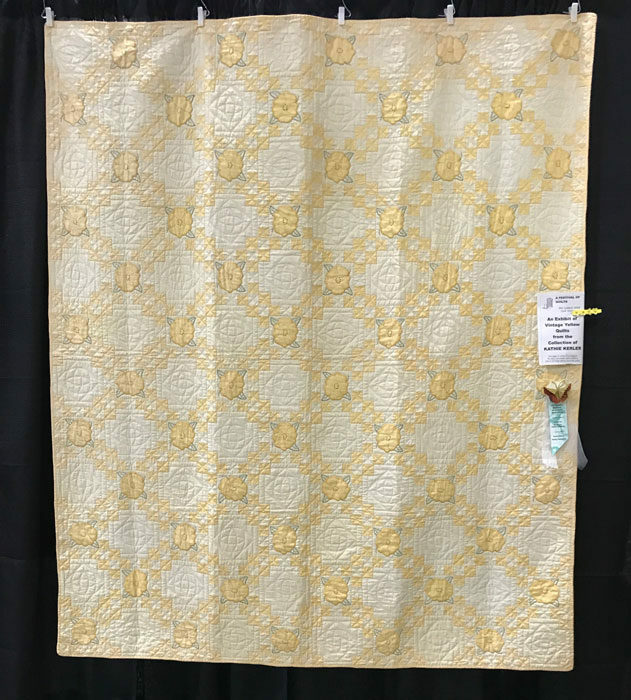 My favorite quilt of the show was created by Dianne Denhem and quilted by Kazumi Peterson. The design source is “Something Blue” by Jacqueline de Jonge. Such a beautiful monochromatic color scheme. 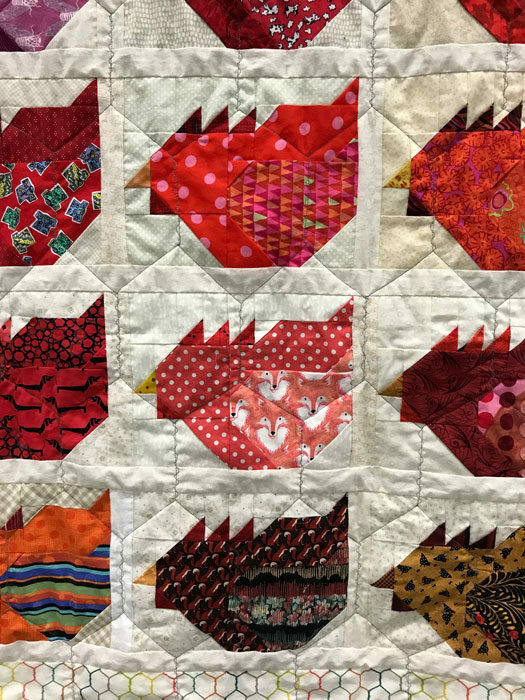 Sally Trude creates wonderful animal quilts. She has a great one with pigs. This year it was chickens. Color gradation adds to the lively block. 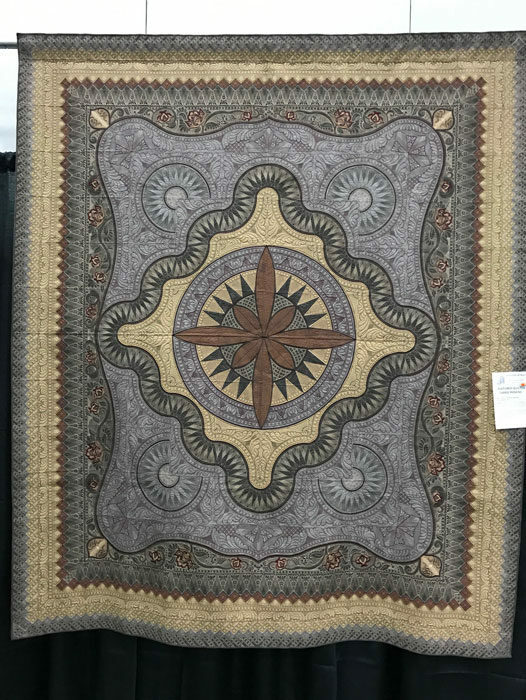 Carrie Perkins was the guild’s featured quilter. She also happens to be the long-time raffle quilt chair. 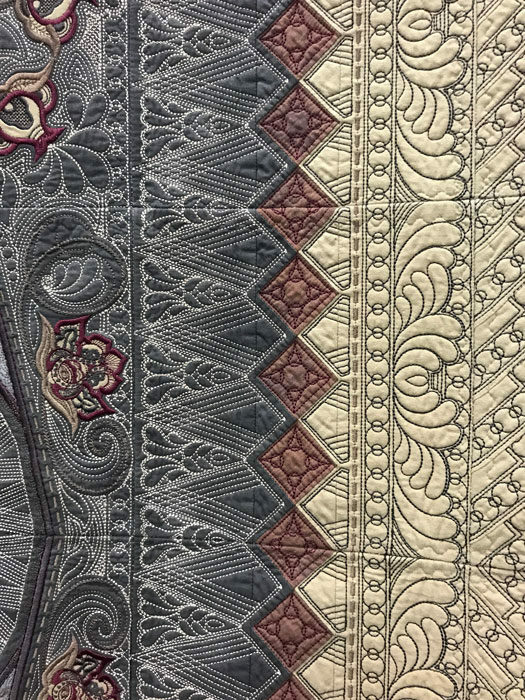 Here are my two favorite quilts by Carrie. This first is a machine-embroidered stunner. 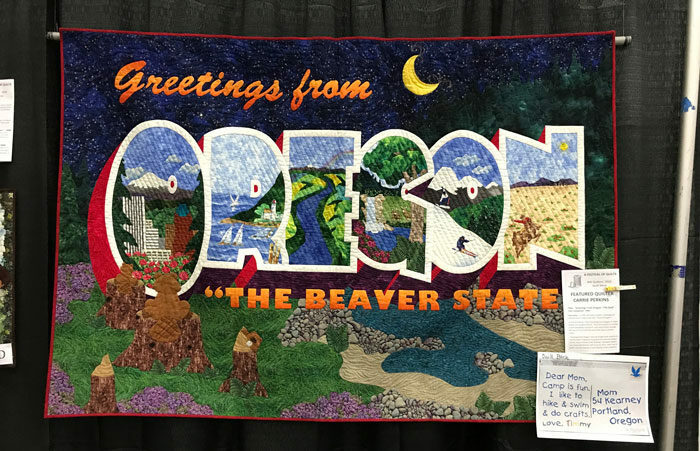 The second quilt honors Oregon and won an award at the American Quilters’ Society show in Paducah. I forgot to get a close-up of the title, and I can’t read it in this photo. 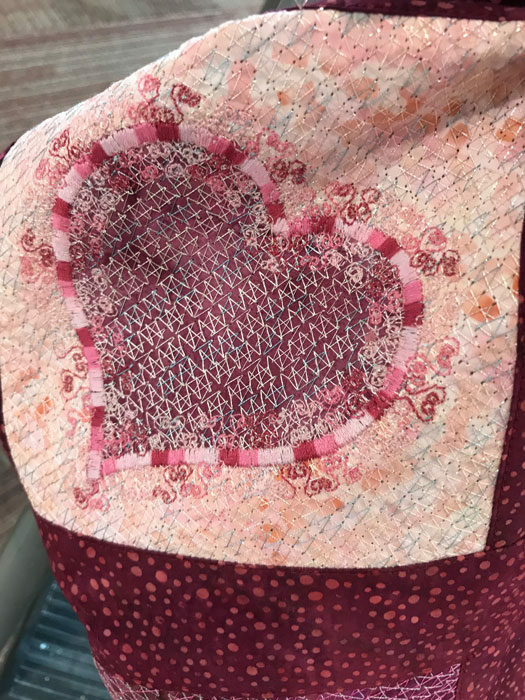 Last September I taught my Zigzag Pizzazz technique to Northwest Quilters members. 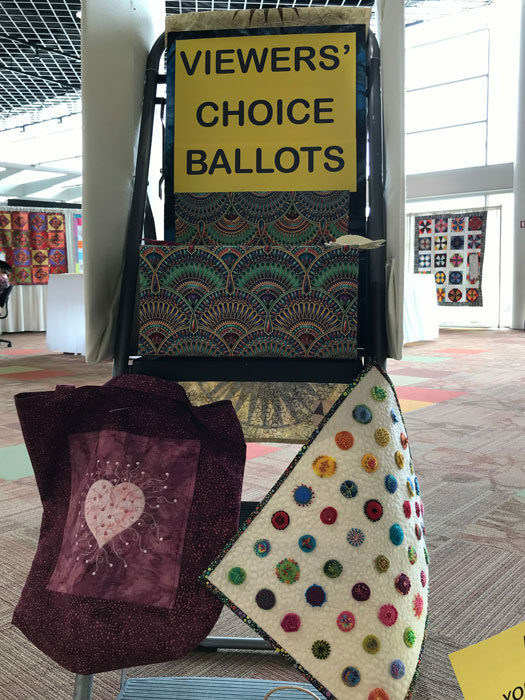 Denise Gies finished several blocks and used them in a tote bag, which was used to dress the viewers’ choice box. 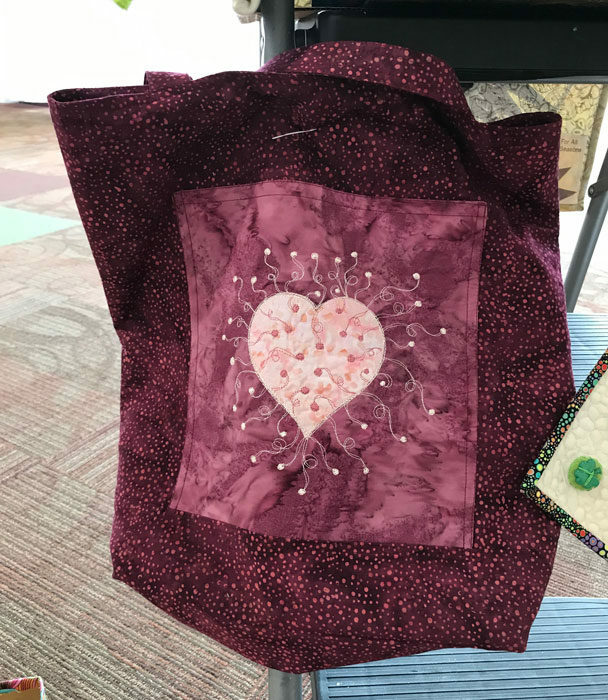 Denise’s bag on one side and Kathleen Schmidt’s Sue Spargo sampler on the other. On the back Denise stitched four blocks featuring a variety of zigzag pizzazz variations. The bag was secured to the ladder, so my pics are a bit awkward.